Frederick Steiner said the policy was not "appropriate" for higher education and "did not make logical sense". Many higher education officials and students have objected to the law, with concerns it may discourage students from attending universities in Texas. Supporters of the law argue it is "critical" to self-defence and upholding constitutional rights. "I grew up believing there was an appropriate place for guns and it was not in a place of higher education and higher learning," he told Fox News. "I thought I would be responsible for enforcing a law I don't believe in," said Mr Steiner, who has been at the school since 2001. He says he plans to return to the University of Pennsylvania, but not until the law is passed in August. Greg Fenves, president of the University of Texas, has said he does not support guns on campus but he must enforce the law. Mr Fenves said that the law would make it more difficult to keep faculty and students at the university. Long-time dean Frederick Steiner agreed, saying it was "already part of the conversation when I was trying to recruit and retain graduate students." Meanwhile, staff at the University of Houston have warned professors there to be careful discussing sensitive topics and drop them from the curriculum if they "sense anger" from students who may be armed. According to the Houston Chronicle, they have been instructed to "not 'go there' if you sense anger; limit student access off hours; go to appointment-only office hours; only meet 'that student' in controlled circumstances". 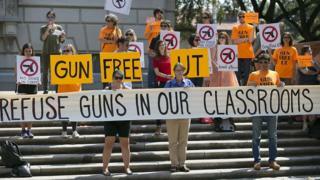 According to the law, private universities are allowed to ban guns on campus.